Annemarie Masson, of Montreal, Canada, is an award-winning artists and interior designer. She has moved to St. Petersburg, FL and will have her debut show, “Transitions” on February 22, 2019. 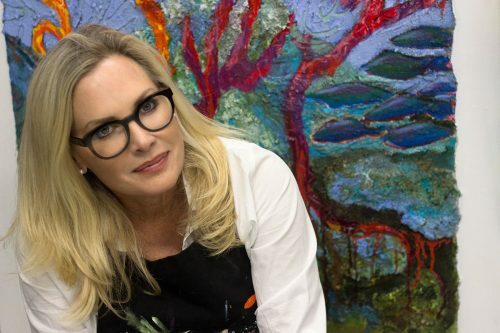 Saint Petersburg, Florida, USA - January 22, 2019 /MarketersMedia/ — Accomplished, award-winning Montreal artist, Annemarie Masson, has been wooed by St. Petersburg, Florida and its new Central Florida Cultural Center status, and will be having her debut solo show, Transitions, on February 22nd at NOVA535. Her larger-than-life, vibrant art comes alive with nature and sea life. A must see for contemporary art lovers. “Annemarie’s subjects are always one with nature, with exhaled boldness and vivid color on canvas. Her compositions are structured, textured and her collages on canvas are a collection of handpicked elements of nature. Her works are expressionistic and at times almost humoristic, as is the artist, and these expressions are found on large scales that belong to the contemporary times in which we live today,” says B. Richer La Fleche, BFA Art History, BFA Studio Art of Concordia University Montreal. Annemarie Masson chose NOVA535, for her show, Transitions, because of the ambiance that is unique to NOVA535. Located at 535 Dr. Martin Luther King Jr. St. N, in downtown St. Petersburg, NOVA provides the perfect atmosphere for the public to enjoy Annemarie’s art at its full glory and impact. Her show is a fusion of art and nightlife. For those wishing to attend, they can RSVP on Facebook at Annemarie Masson Art Transitions. Annemarie and Chief, her Labrador who became famous as Aquadog in the Tampa Bay Times, last year, reside at the ArtsXchange building (studio #208), in the Warehouse Arts District’s in St. Petersburg. Here she can be found working on her latest creations and showcasing her previous awe-inspiring work. Annemarie Masson is a fine artist with a degree from College-Jean-de-Brebeuf in Montreal and an interior designer. She started out as a textile illustrator, with many of her designs being sold at retail stores like Neiman Marcus, in New York. This led her to study graphic design at Boston Art Institute. Returning to Canada, Annemarie then worked for The Globe and Mail’s West Magazine and Match Point Magazine in graphics and sales. Annemarie worked as an interior designer for 20 years, while raising her three children, and is now a full-time artist.